APLS Thermal Wrap is a portable and disposable absorbent litter designed to keep injured personnel warm during transportation and treatment. A treated nylon backing protects against wind and moisture, while two opposing fleece-lined panels fold over the patient to provide additional thermal protection. APLS Thermal Wrap includes two closable access points that enable the patient to retain body heat while being treated by medical personnel. Constructed with a highly absorbent core and durable nylon backing, each APLS Thermal Wrap can absorb up to 4.5 liters of fluid while supporting up to 450 pounds, wet or dry. 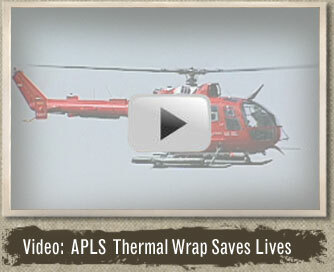 APLS Thermal Wrap includes eight reinforced handles that allow for carrying and easy transport. A closable pocket inside APLS Thermal Wrap holds patient documents, x-ray disks and personal effects. Photo Courtesy of U.S. Navy by Mass Communication Specialist 2nd Class Kilho Park.